restore the vital fluids that cushion bones and joints. Celadrin® Fatty Acids and Inflammation: Anti-inflammatories work by inhibiting the enzymes responsible for setting off an inflammatory response. These enzymes are COX-2 and 5-LOX. The myristoleic acids and the cetylated fatty acids in Celadrin® may alter the 5-LOX enzyme and change the leukotriene production, inhibiting inflammatory prostaglandin compounds. Prostaglandins make the tissue around the injury swell up and become inflamed, causing pain. Celadrin® & Anti-Inflammatory Action: Celadrin® works in a similar but more dramatic way to EPA and DHA in fish oils. Celadrin® helps to decrease inflammatory responses, lubricate cell membranes and restore fluids that cushion bones and joints. In this way, Celadrin® sparks positive changes in cell membranes making them less prone to articular cartilage deterioration and inflammation. 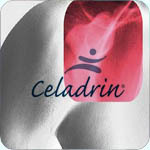 Celadrin® & Joint Health Research: Celadrin® is a medically and clinically proven pain management compound. The anti-inflammatory actions of Celadrin have been demonstrated by one double-blind, placebo controlled trial that showed Celadrin, when taken orally at recommended intake levels, decreased pain scores and increased walking distance compared to the group receiving placebo. The authors theorise that Celadrin may work by down-regulating the effect of certain precursors of the body’s inflammatory response. Research published in the Rheumatology journal (2004) showed that Celadrin® has an impact on improving the range of motion in joints. The study found that the subjects given Celadrin® had decreased pain scores and increased walking distance compared to the group receiving placebo. Celadrin® showed significant benefit beyond the arthritic medication the subjects were taking. Celadrin® is effective when used orally and topically and is available as capsules or lipocreams. Celadrin® & Joint Health: Celadrin® promotes joint health by improving flexibility, pain management and mobility and may be useful in a variety of inflammatory joint & tendon health conditions e.g. sports injuries; arthritis; lupus; bursitis; gout. Celadrin® & Skin Health: Celadrin® systematically enhances and lubricates cell membranes throughout the body providing youthful cell fluidity and elasticity. This action gives it potential use as an anti-ageing skin health supplement. Due to its anti-inflammatory action, Celadrin® is also currenly being researched for its positive effects on psoriasis and gingivitis. Health Tip: Try combining with D-Flame herbal anti-inflammatory complex for additional relief from inflammatory painful joint conditions.